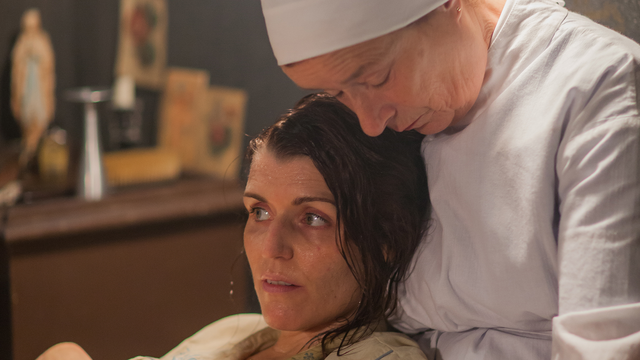 I’m not so sure how Call the Midwife manages to do this every week, but I always manage to see the parallels between the episode’s plot and my modern day practice. This week, we met Tony and Marie Amos, a seemingly picture-perfect couple who are beautiful, in love, and expecting their first baby. We learn that Tony is struggling with this relationship because he is gay, and he is unfortunately discovered by Sgt. Noakes during an undercover operation. Tony is arrested, and suddenly, he is outed to his family and the public as a gay man. In 1960, his homosexuality as well as “committing a lewd act” as he was charged is punishable with up to 2 years in prison. Even though Tony has Dr. Turner serve as a character witness in court and manages to avoid a prison sentence, he is forced into “treatment” to “cure” him; essentially, he must take estrogen pills, which will suppress his body’s natural testosterone, and while that won’t make Tony suddenly heterosexual, it does cause impotence and will decrease his libido so he will likely end up having no sexual urges whatsoever. One of the more difficult parts of this episode was when Tony decides he would rather commit suicide as opposed to undergo this harsh “treatment.” He does not know that at the same time, Marie is in labor. Thankfully, Marie’s father is able to get to Tony in time. While this solved the immediate issue of Tony’s suicide attempt, we are left wondering what will become of Tony and Marie. It seems that Marie, her father, and most of Poplar wants Tony to become something he is not. That’s a hard pill to swallow. While some progress has been made since 1960 with regards to lesbian, gay, bisexual, transgender, and queer (LGBTQ) rights, we still have a long way to go. LGBTQ youth are more than twice as likely as their heterosexual peers to attempt suicide (CDC, 2014). So what does this, and Marie and Tony’s story, have to do with midwifery? Midwives often meet people at their most vulnerable. A young woman may be coming in for her first annual exam, or a pregnant woman is coming in for prenatal care. Women come from different walks of life, and as a midwife we must strive to give compassionate care to everyone we meet. Much like Patsy explains, part of midwifery is being available for support, and sometimes simply listening to the struggles that our clients may be experiencing. It’s also crucial that midwives are inclusive and nonjudgmental when it comes to non-heteronormative lifestyles. I was pleasantly surprised to hear Trixie giving her adamant support that love is love, and who someone loves shouldn’t be a concern of others. Trixie is awfully progressive for 1960s Poplar! Like I mentioned before, we may have come a long way with how we care for a respond to LGBTQ couples and parents, but there is still a lot of work to be done. LGBTQ families might have a hard time within the healthcare system because of seemingly simple things like the language we use when taking a history, lack of social support, and discrimination from providers and other healthcare staff (Varney, 2015). As a midwife, I feel it is important to be open, supportive, and strive to be understanding of all clients, regardless of sexual orientation or gender identity. This means not making assumptions about someone’s lifestyle, beliefs, or parenting roles. Trixie, Patsy, and most of the other midwives of Nonnatus House did a wonderful job providing compassionate care to their clients, regardless of lifestyle or socioeconomic status. The writers of Call the Midwife never cease to amaze me with their poignant portrayals of sensitive topics. References: Centers for Disease Control and Prevention. (2014). Lesbian, Gay, Bisexual, and Transgender Youth. From www.cdc.gov/lgbthealth/youth.htm. King, T. L., Brucker, M. C., Kriebs, J. M., Fahey, J. O., Gegor, C. L., & Varney, H. (2015). Beyond Gender. Varney’s Midwifery (5th edition), p. 1116.